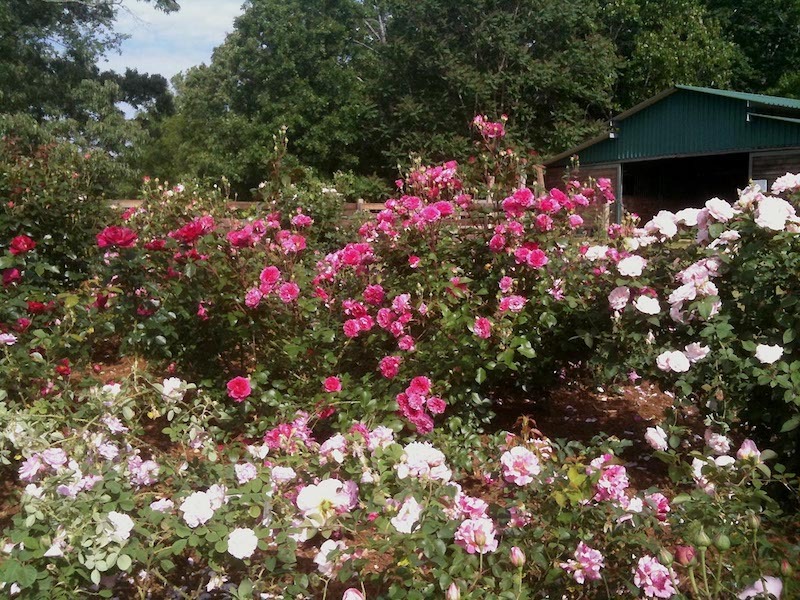 My own rose garden on our farm. I like the edges of the canopies to mingle. 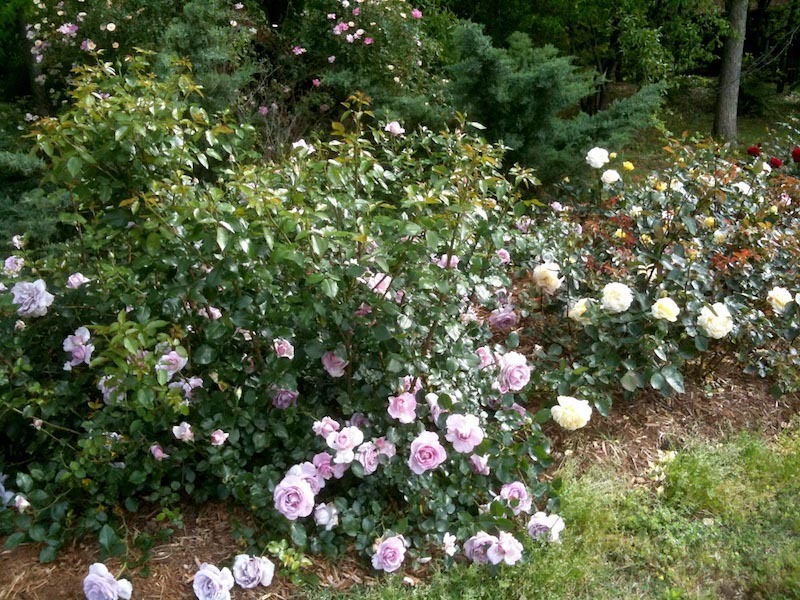 If you are new to roses, or even experienced, you are likely a bit puzzled over how far apart (or how close together) you should plant rose bushes. Most likely you consulted a few rose guides and the recommended advice is to space them far apart so they don’t touch each other giving them lots and lots of “air circulation”. The latter being “sold” as a magic disease preventative measure. The end result of this kind of spacing is lots of bare ground to look at between the plants and in my opinion a pretty boring vista. 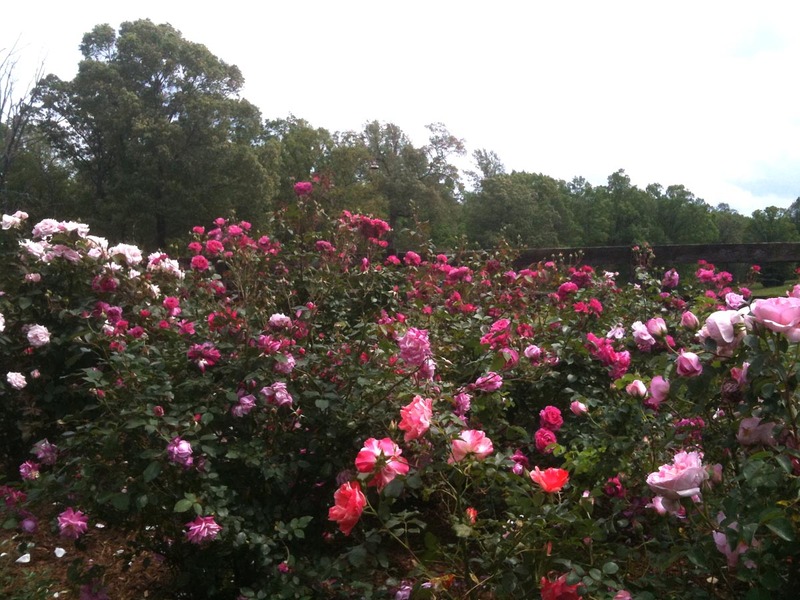 The sight of rose bushes in regimentally spaced rows like soldiers on inspection doesn’t exactly take my breath away. In fact it usually puts me to sleep. Frankly, I don’t know of any other plant in the garden where the recommendation is to plant them so far apart. So if Roses Are Plants, Too why can’t we plant them close together like other plants? Another view of our garden. I start by choosing roses that are disease resistant for my area. Keep in mind this idea of spacing came about at the recommendation of folks who exhibit roses. You need to be able to get all around the plant to groom it and you don’t want the individual blooms brushing up against each other and potentially causing damage. This makes perfect sense if you exhibit roses. I like a mass riot of color and bloom. I don’t want to see the ground. In fact I want my rose garden to look like a carpet of blooms where you feel you could just step up onto the roses and walk across their canopy without your feet ever touching the ground. I want them to grow into each other so they can mingle their blooms on the fringes of their reach. I like to think my roses can actually shake hands with each other – or in their case blooms! A bed of young roses. Mass plantings of the same variety (25-20 per group) spaced 20 inches apart and 36 inches between the masses. To this end I choose good Garden Roses and plant them anywhere from 20 inches to 30 inches apart depending on the ultimate size of the plant. If you live in warmer climates you may need to space them further apart. Cooler climates can go tighter all the while keeping in mind the ultimate size of the individual variety of rose. So feel free to space your Garden Roses like you would any other shrub in the garden. As to air circulation if someone says they must have it for roses I suggest you tell them to go buy a couple of large fans!